Popcorn has gotten a bad rap, from movie theater tubs overflowing with salt and grease. But if you can resist drenching it in butter, popcorn is in fact a whole grain, boasting fiber, antioxidants, and other health benefits. Get back to the grain and lighten up your toppings for a crunchy and satisfying snack. Dark Chocolate & Sea Salt: Bittersweet chocolate packs big flavor—but fewer calories than puppy chow. While the popcorn is still hot, immediately scatter with 2 oz (60 g) finely chopped dark chocolate and stir to melt and coat. Sprinkle lightly with sea salt and serve. Peanut Butter & Honey: Stir in your favorite nut butter! In a small bowl, add 2 tablespoons honey and 2 tablespoons unsweetened peanut butter. Microwave until loose and warm, about 1 minute, and stir to combine. Pour over the popcorn and toss to coat. Sprinkle lightly with salt and serve. Parmesan & Black Pepper: Craving something cheesy? Drizzle 2 tablespoons extra-virgin olive oil over the popcorn. Sprinkle with ¼ cup (1 oz/30 g) shredded parmesan cheese. Season generously with coarsely ground black pepper and toss to coat. Sprinkle lightly with salt and serve. Garlic & Rosemary: Get fresh with garlic and green herbs. In a small bowl, add 2 tablespoons olive oil and 2 cloves minced garlic. Microwave until the oil is warm and the garlic is fragrant, about 1 minute, and stir to combine. Pour over the popcorn. Sprinkle with ¼ cup (1/3 oz/10 g) finely chopped, fresh rosemary leaves and toss to coat. Sprinkle lightly with salt and serve. Coconut & Curry: Coconut oil is the perfect partner for warm spice. In a small bowl, stir together 1 tablespoon yellow curry powder, 1 teaspoon ground cumin, and a pinch of cayenne pepper. Drizzle 2 tablespoons melted coconut oil over the popcorn. Sprinkle with the spice mixture and toss to coat. Sprinkle lightly with salt and serve. Dried Fruit & Nuts: Better than crackerjack! Drizzle 2 tablespoons maple syrup over the popcorn. Add ¼ cup (1 oz/30 g) pecans and ¼ cup (1 oz/30 g) dried cranberries and toss to combine. Sprinkle lightly with salt and serve. 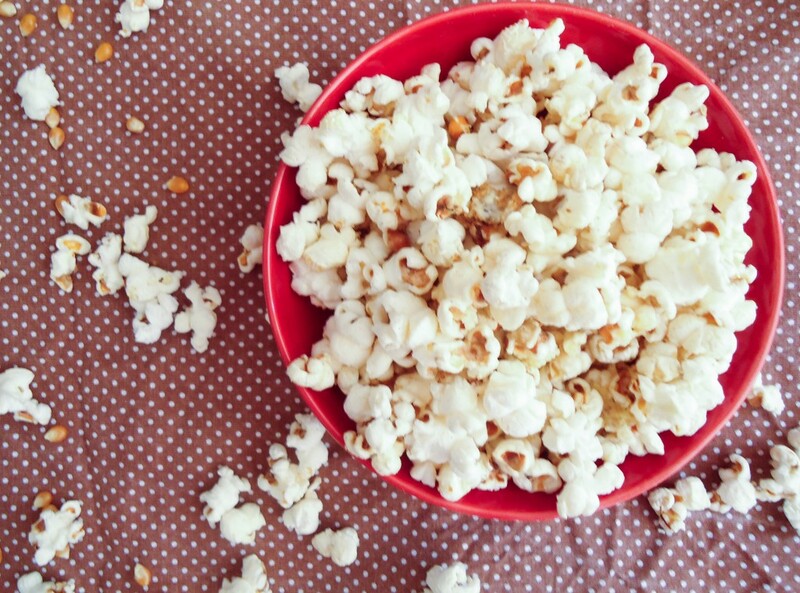 Wasabi powder, lime juice, nutritional yeast – there’s a lot of crazy stuff you can put on popcorn! Written by Becky Duffett, this article was originally published on the Fitbit blog.